Every morning, the fine folks at Sports Radio Interviews sift through the a.m. drive-time chatter to bring you the best interviews with coaches, players, and personalities across the sports landscape. Today: Next year the Lions might see 106 man-games lost to suspension. 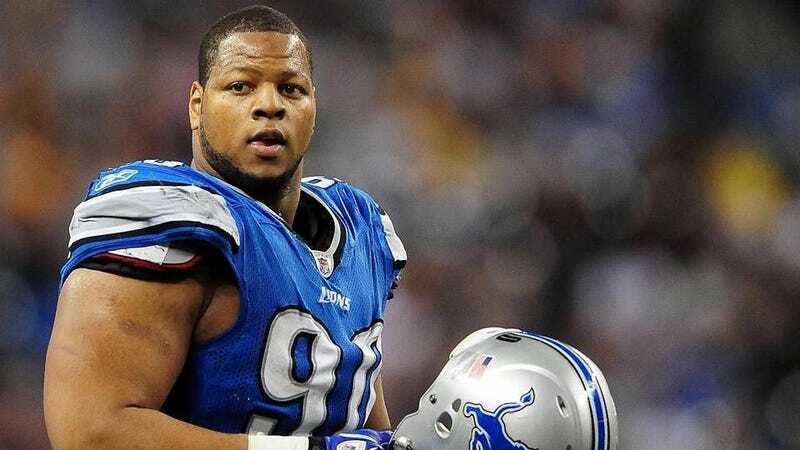 Ndamukong Suh joined KTAR in Phoenix with Doug and Wolf to discuss if he's the best defensive tackle in the league, what he has to work on at this point, if he's a good guy, looking ahead to the future instead of back in the past, playing in the playoffs for the first time, being a leader, serving as a Grand Marshal at a NASCAR race and his former experiences in auto racing. "No, I don't. I think I have a lot of work ahead of myself to even be considered in that group, but I'm definitely not going to hold myself down in any means in terms of having an opportunity to be up there with some of the greats. There's a lot of guys that are actually in the league right now that are quite good. One of them that I definitely consider a top defensive tackle is Haloti Ngata. He's consistently doing it year-in and year-out and I look to kind of follow in those footsteps." "There's a lot of things that I can improve. There's ways that from my rookie season to last year with having a little bit down stats-wise. There's other ways from stats to helping my other teammates produce that I can get better at. Being able to go in and watch film when I was back in Detroit early last week, I saw some mistakes that I had and I look forward to correcting them." "I think any football is a guy that is able to one, be able to be humble and hungry off the field, but at the same time on the football field understand what they have to get done and be a little bit ferocious. Defensive players kind of have that two-faced kind of way of being able to be very aggressive on the football field and going out there and getting there job done. At the same time, from my own incidents and my own personality, I'm much a person that's very likable and lovable." "I think the biggest thing is just moving past everything and looking forward to this 2012 season. Like I said, I was lucky enough to be back in Detroit doing some different things earlier last week and preparing for this upcoming season. … That's where my focus is and I think that's the most important thing." "I think it's very, very tough to compare postseason and in-season just for the simple fact that there's the heightened levels of energy on both sides of the ball. It's really, being in my first playoff game, I felt like I had to play 10 games the amount of energy I had going into that game." "I definitely see myself as a leader. One of the ways I've been lucky enough to lead and likely to continue to lead is just my actions and the way that I approach the game and working hard and being a player that steps up in big-time situations when plays need to be made. I feel like I did that a good amount in my rookie season. I might have slipped a little bit in my sophomore season, but I look forward to picking up and getting back on the high horse." "Well, I'm lucky enough to be a Subway sandwich fan and really I got the opportunity with me being able to be a partner of the great Subway. They asked me if I wanted to do it and I was ecstatic to be able to have the opportunity to be the Grand Marshal. I know everybody as children who are big NASCAR fans and motor fans always want to have the opportunity to say, ‘Gentlemen start your engines.'" "Oh yeah. I took part in my first NASCAR one at the MIS in Michigan. On another note I've been lucky enough to take very, very big parts in exclusive opportunities to be a part of the Indianapolis 500 and then internationally the Formula One in Monaco." • Alex Rodriguez is cool with Jason Varitek. • Dan Guerrero won't decide Ben Howland's future right away. • Matt Kalil felt like a piece of meat after the NFL combine.